There's another wonderful volume out in Kalmbach's Stitch Workshop series! 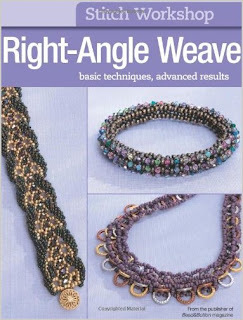 I really liked the volumes that featured peyote stitch and herringbone, and Right-Angle Weave is proving to be no exception to the rule. Although the projects have been previously published in Bead&Button magazine, there is a lot of value added in the complete exploration of the stitch that this 80 page book gives. The history and development of the right-angle weave is covered, and RAW fans will be thrilled to see the variety of looks that can be achieved by substituting different colors and sizes of beads. Prepare to go waaaay beyond the geometric forms that you're used to thinking of with RAW: there are projects that will teach you to create curves, to work in three dimensional forms, and to just loosen up and have fun with the stitch. With 28 great projects from nearly as many fabulous designers, there's bound to be ideas that will have you racing for your beads.